Bob Shiles | The Robesonian Allan Williams, center, is presented a proclamation in recognition of his efforts to save a neighbor who was attacked by three pit bulls. Making the presentation is St. Pauls Commissioner Evans Jackson, right, and Mayor Jerry Weindel. 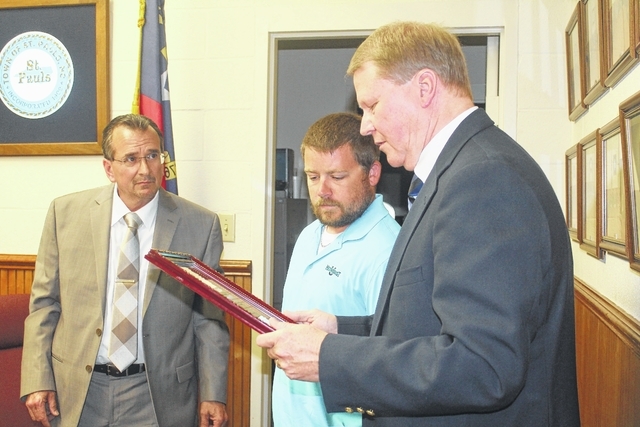 The St. Pauls Board of Commissioners on Thursday recognized a town resident for his “heroic efforts” in saving the life of an elderly neighbor who was attacked by THREE PIT BULLS last year. “He definitely saved the life of this man,” said Commissioner W. Evans Jackson, who is also the town’s fire chief, of Allan Williams. Jackson presented a board-adopted resolution to Williams, 29, who has been a member of the St. Pauls Volunteer Fire Department since 2002. Williams, who is employed by Methodist University and operates his own lawn care business, was doing lawn work across the street from the home of James Davis on McRainey Road when he heard Davis cry for help. When he saw Davis on the ground with three pit bulls on top of him, Williams grabbed a pitchfork and ran across the street to help. Davis, who suffered severe injuries, was able to get back into the safety of his home while the attention of the dogs was on Williams. Williams said that two of the dogs, both puppies, ran away after attacking Davis, but the third, the mother of the two puppies, came after him. He suffered severe bites to his right arm and left foot. The injuries kept him out of work for more than a month. Thursday’s recognition was the second time in recent weeks that Williams was honored by the community. He recently received the Humanitarian Award from the St. Pauls Chamber of Commerce.